OPEN AIR has officially ended, but recordings can still be submitted to the project website, www.openairphilly.net, where anyone can send, listen to, and rate messages. New submissions to the project website will create virtual OPEN AIR designs. 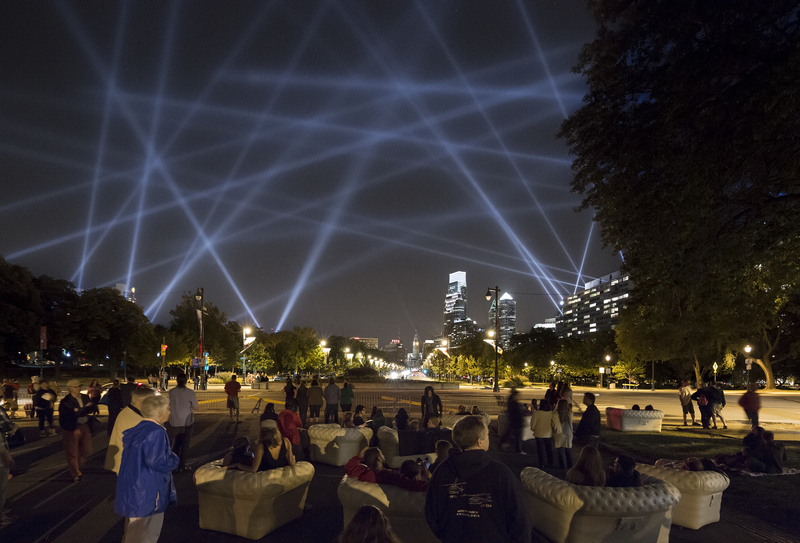 Commissioned by the Association for Public Art, Rafael Lozano-Hemmer’s OPEN AIR was a world-premiere interactive light installation for the Benjamin Franklin Parkway that ran nightly from September 20 – October 14, 2012. 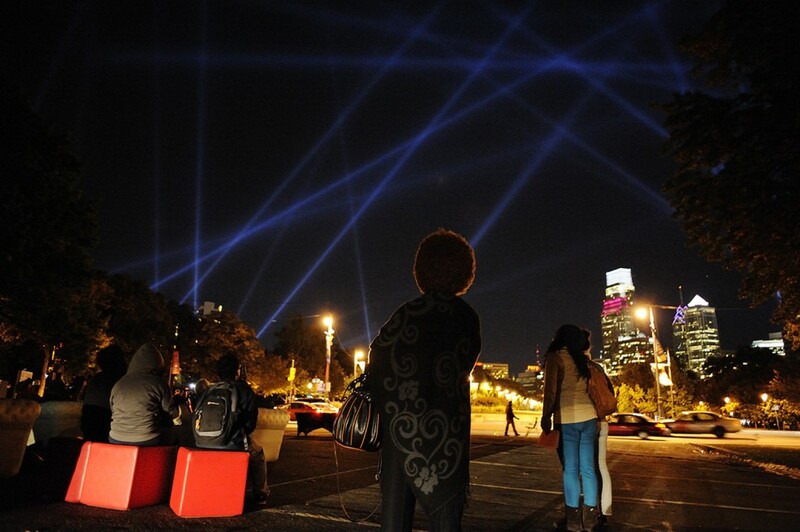 The piece transformed Philadelphia’s night sky with 24 powerful robotic searchlights that were directed by participants’ voices and GPS locations. Inspired by the city’s rich tradition of democracy and respect for free speech, OPEN AIR was created specifically for Philadelphia and for participation by the general public. Using a free mobile app developed by Lozano-Hemmer’s studio, participants were invited to record and submit messages of up to 30 seconds in length – shout-outs, poems, songs, rants, dedications, proposals. 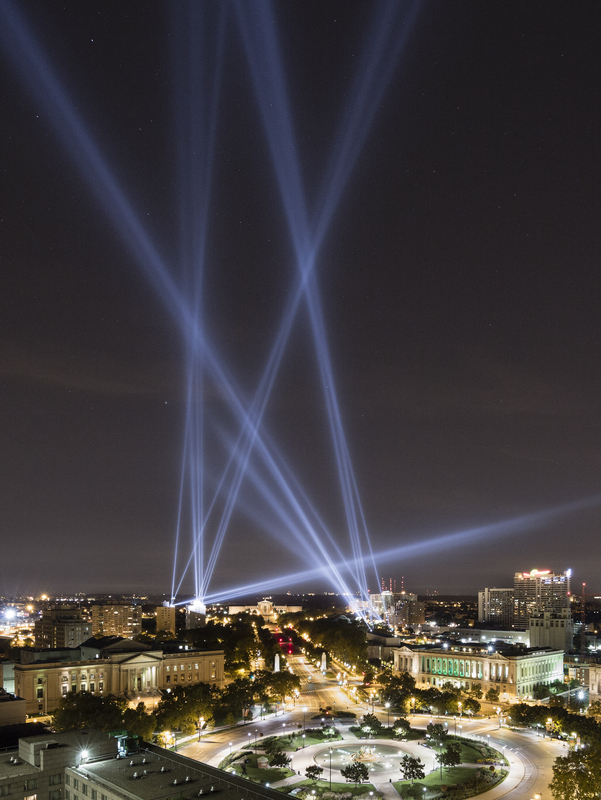 In response, 24 searchlights stationed strategically along a half-mile section of the Parkway created unique, dynamic light formations in the sky. 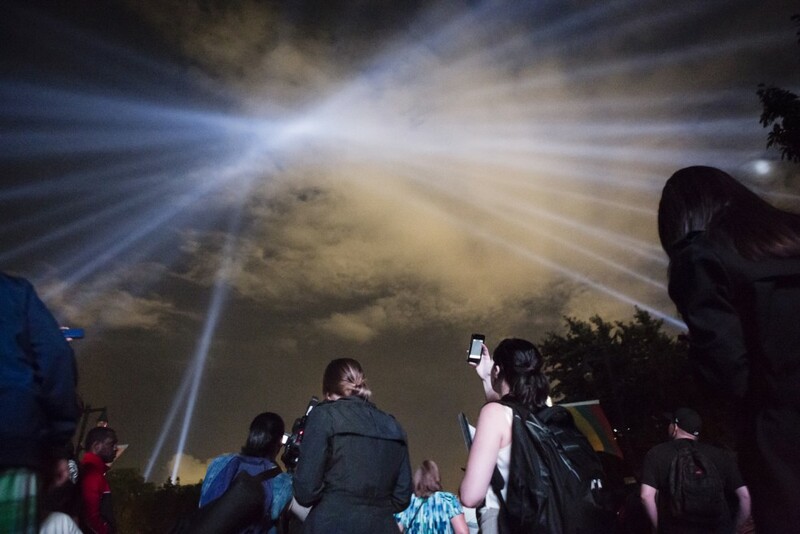 The lights reacted in brightness and position to the GPS locations of participants and the frequency and amplitude of their voice recording, which could be heard through the app, the project website, and public speakers located at the Project Information Center and Information Outpost along the Parkway. 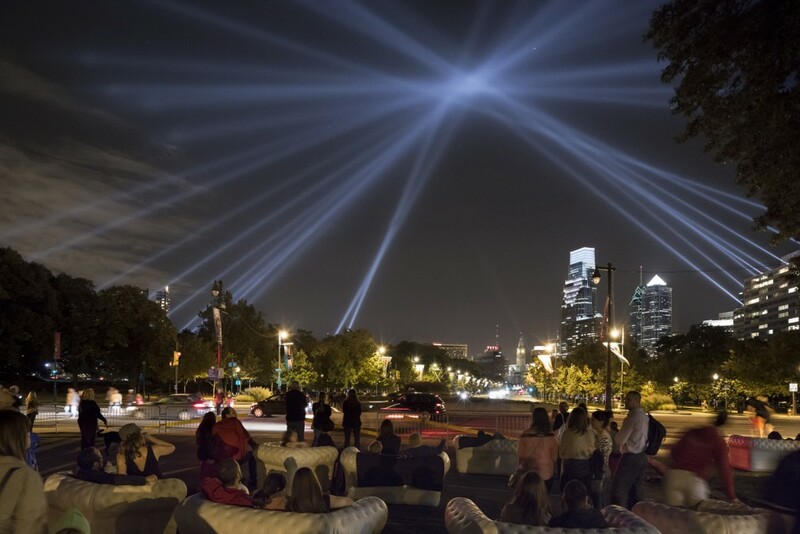 Priority was given to those submitting messages from the Parkway, but for those not onsite, the project website, www.openairphilly.net, allowed users to record messages that were archived and played back by the lights if other web visitors rated them highly. All participants had a personalized webpage created automatically with their message, comments, and images of the light sculptures that their voice created. Each evening, invited community groups were the first voices and opened the night with their featured messages. The archive (accessible on the project website) also features selected “Voices of Philly,” recorded messages from distinct individuals past and present who have inspired and influenced the flavor of Philadelphia. 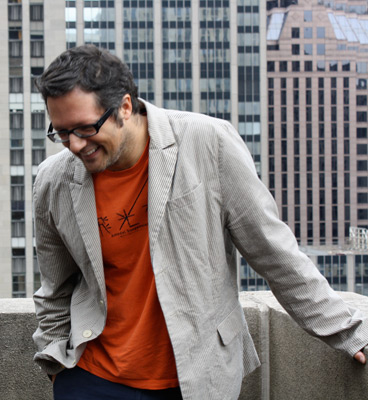 Rafael Lozano-Hemmer is an internationally recognized Mexican-Canadian artist who develops large-scale interactive installations that are at the intersection of visual art, architecture, and performance art. His main interest is in creating platforms for public participation by perverting technologies such as robotics, computerized surveillance, or telematic networks. His work has been commissioned for events across the globe such as the Millennium Celebrations in Mexico City (1999), the Cultural Capital of Europe in Rotterdam (2001), the United Nations’ World Summit of Cities in Lyon (2003), the Expansion of the European Union in Dublin (2004), the 50th Anniversary of the Guggenheim Museum in New York (2009), and the Winter Olympics in Vancouver (2010). His work in kinetic sculpture, responsive environments, video installation, and photography has been shown in museums in four dozen countries and Bienniels around the world. 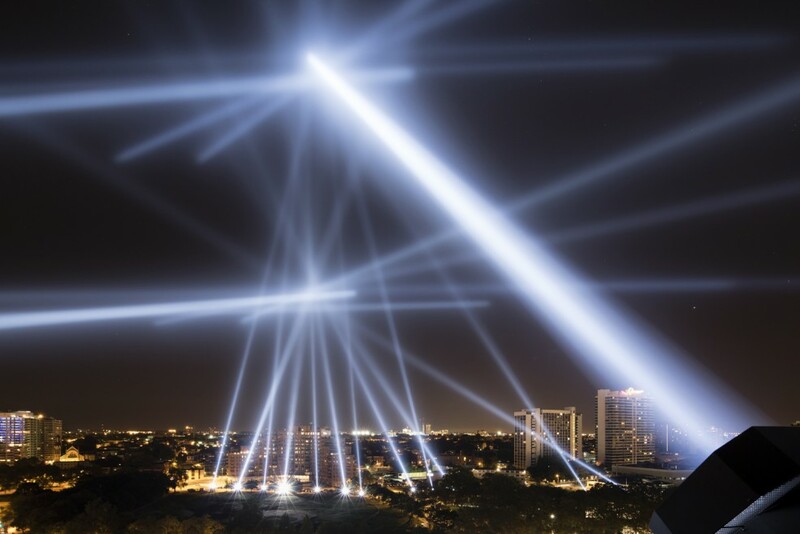 For more information on the artist, visit www.lozano-hemmer.com. 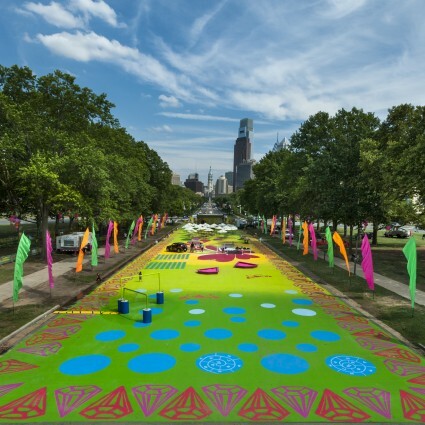 The Opening Night Celebrations is a FREE public event on September 20, 2012 from 7:30pm – 11:00pm on the inner drive of the Benjamin Franklin Parkway. Opening Remarks and Ceremonial Lighting begin at 8:30 pm. The celebration will include a selection of local food trucks, a live countdown and ceremonial lighting, as well as a presentation by the artist and other special guests. Click here for the Opening Night program. *Congratulations to the Friends Select School for being the first public voice of OPEN AIR! 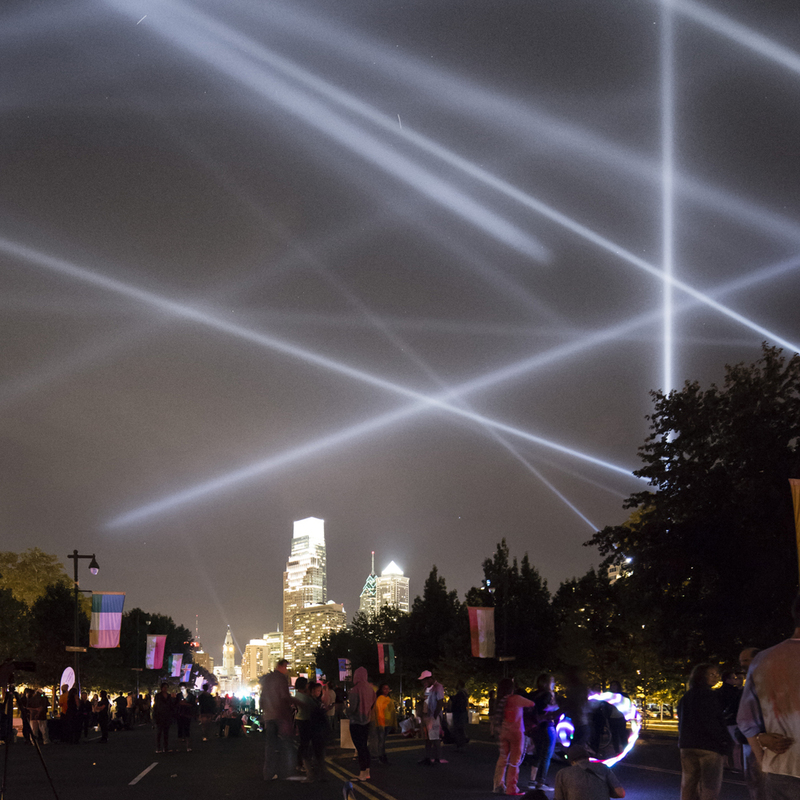 Having received the highest rating and most votes, their recorded message on www.openairphilly.net was the first to be played during the Opening Celebration on September 20, 2012. Click here to hear their message. On the occasion of Rafael Lozano-Hemmer’s newest public artwork, OPEN AIR, commissioned by the Association for Public Art, “Performing Freedom” is a panel discussion (or conversation) exploring the possibilities of technology in the service of art to reinforce the public sphere as a site for the coexistence and intermingling of connective spectacle, alternative narratives, and individual agency. Panel participants include: Rafael Lozano-Hemmer; Steve Dietz, President and Artistic Director, Northern Lights, and Founding and Artistic Director, 01SJ Biennial; and Penny Balkin Bach, Artistic and Executive Director, Association for Public Art. 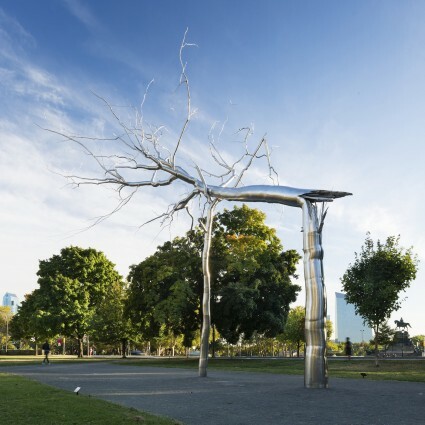 In conjunction with the Association for Public Art and the DesignPhiladelphia Festival, PennDesign is pleased to welcome Richard Sommer, Dean of Architecture, Landscape, and Design at the University of Toronto, in conversation with Rafael Lozano-Hemmer, creator of the interactive public art project OPEN AIR. Ken Lum, Professor and Director of the Undergraduate Fine Arts Program and noted public artist himself, will introduce and Penny Balkin Bach, Artistic and Executive Director of the Association for Public Art will moderate. The conversation will be preceded by Sommer giving a talk in which he will situate Philadelphia, and Lozano-Hemmer’s work within his theory of the Democratic Monument, and a short presentation by Lozano-Hemmer. 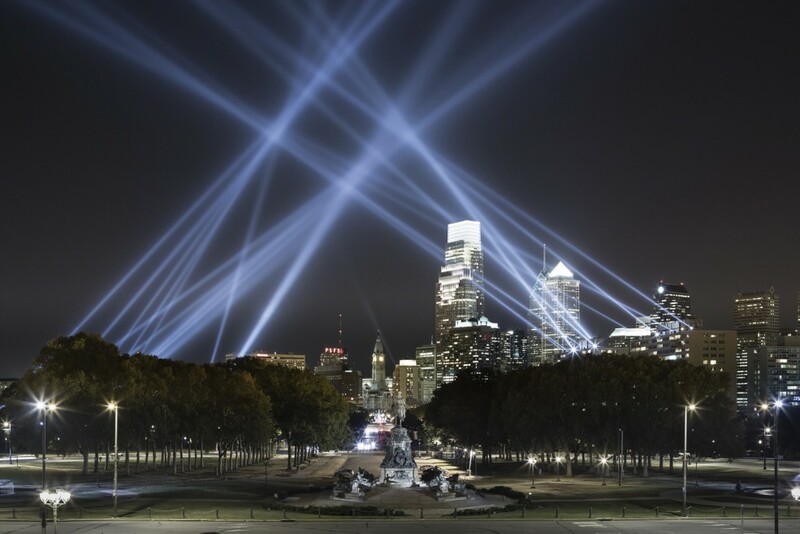 The Association for Public Art, the Franklin Institute and artist Rafael Lozano-Hemmer invite you to “Planetarium on the Parkway”: a free interactive presentation of Philadelphia’s night sky, hosted by Chief Astronomer Derrick Pitts. 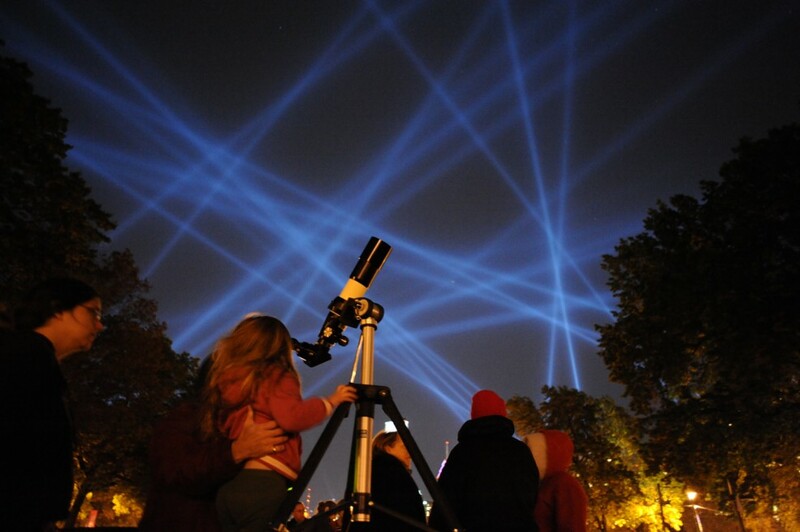 A dynamic and inspirational speaker, Dr. Pitts will direct the robotic searchlights currently performing the artwork OPEN AIR to highlight salient stellar objects viewable from the Parkway. Amateur and budding astronomers are welcome to bring their telescopes! 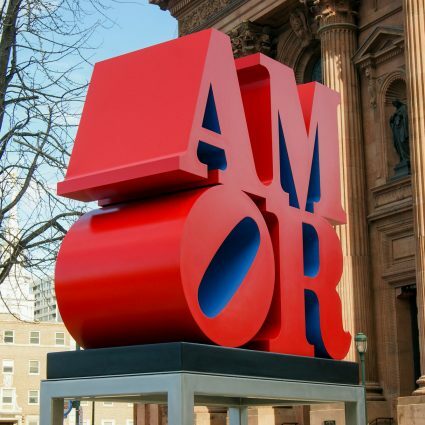 To kick-off each evening, diverse community groups and their messages will be featured at 8:00pm the OPEN AIR Project Information Center at Eakins Oval. A list of featured groups and their scheduled participation can be found in the OPEN AIR brochure. 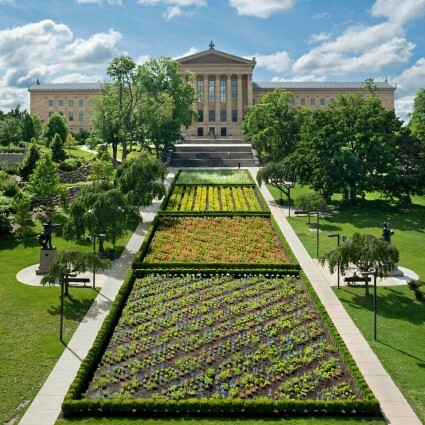 Partners and Supporters of OPEN AIR include: the John S. and James L. Knight Foundation; the National Endowment for the Arts; the City of Philadelphia Parks & Recreation and Office of Arts, Culture and the Creative Economy; Audubon Pennsylvania, Greater Philadelphia Tourism Marketing Corporation (GPTMC); Center City District; Parkway Council Foundation; Canadian and Mexican Consulates; Mexican Cultural Center; Park Towne Place Apartments – an Aimco Community; Philadelphia Museum of Art and the Rodin Museum; Sautter Crane Rental; The Victory Foundation; Independence Foundation; Prudent Management Associates; Theodore R. and Barbara B. Aronson; The Honickman Foundation; H.F. (Gerry) Lenfest; The Pincus Foundation; 6abc, WHYY; Metro Philadelphia; Tierney; Clear Channel; Take One Production; Expert Events; Catering By Design; and individual donors, among others. Additional Donors Include: Dennis Alter; The Arcadia Foundation; Suzanne Sheehan Becker; Brodsky Family Foundation; Burke Family Foundation; Capriccio Cafe; Eugene B. Lefevre; Mr. and Mrs. D. Christopher Levine; Charles E. Mather III, Esq. ; J.J. Medveckis Foundation; Marsha and Jeffrey Perelman; David Seltzer and Lisa Roberts; and Constance and Sankey Williams. Coverage of Rafael Lozano-Hemmer’s OPEN AIR (2012) has been featured in news outlets from around the world including 6abc, WHYY, BBC, The Washington Post, NPR’s Science Friday blog, and more. Roundup: Our Guide To The Best Places To Enjoy Dinner While Watching Open Air, Kicking Off This Thursday, September 20 At 7:30 P.M.
Save The Date: The World Premiere Of “Open Air” – The Giant, Interactive 3-D Light Installation Coming To The Skies Above The Benjamin Franklin Parkway – Is Set For Thursday, September 20 At 7:30 P.M.